There’s no nice way of putting it: 2018 was a tumultuous year for social media. Armed with lessons learnt, 2019 is a chance for marketers to turn a page; to update their digital strategies in response to these changing consumer behaviours. The problem is, the sheer volume in number of ‘trending’ new digital strategies, tech, programs, and platforms can overwhelm even the savviest of social marketers, making it tough to determine which trends are worth adopting to reach the most relevant audiences. We at SOCIETY are here to help. 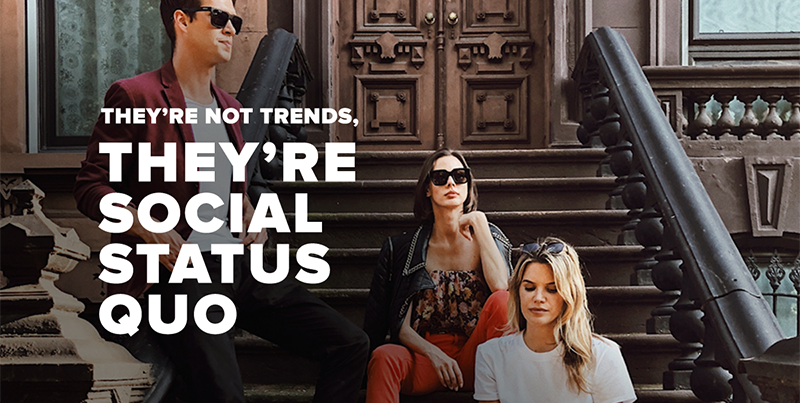 After analyzing the bulk of trends out there in the social ethos, we’ve identified the top ten that are poised to transition out of ‘trending’ to become social status quos. Download the report here. Starting in September, any new and existing campaigns will be migrated to Campaign Budget Optimization— an automated system that optimizes budgets across multiple ad sets in real time. Learn more. Facebook will soon introduce minimum ROAS bidding for Campaign Budget Optimization, allowing you to set the lowest acceptable return on ad spend so you can get more value and control over your ad campaigns. Learn more. According a report from the NYTimes, Facebook plans to integrate WhatsApp, Instagram, and Facebook Messenger. The amount of data and ad-targeting signals harnessed from a merger could make it easier for brands to communicate with users across social channels. Learn more. The test is being carried out by a select few automotive and retail brands to evaluate benefits for brands and consumers. Ads appear against search results related to auto or retail topics. Brands are unable to choose specific keywords, for now. Learn more. The program opens Facebook’s doors to third-party verification solutions to manage brand safety, with DoubleVerify and OpenSlate as the first platforms to be certified. Learn more. Polling stickers have been rolled out across advertisers for paid Instagram Stories ads. With the same look and functionality as organic polling stickers, this is one more interactive way to engage with your audiences. To learn more, reach out to your SOCIETY leads. Shopping is as easy as ever on Instagram. Launching in the U.S. with a select few brands, users can buy products directly from Instagram organic posts, streamlining the path to purchase. Learn more. LinkedIn expects live video to cover content such as conferences, product announcements, Q&As, and more. The LinkedIn product team is seeking nominations for companies to participate in a beta to create compelling, interactive, and timely content through live video. Learn more. Members’ professional interests can be directly derived from content they read, like, comment, or share, or inferred using models that estimate a member’s interest. Lookalikes on LinkedIn are generated from CRM lists or audiences who have visited your site to match against a database of users who share similar traits. Learn more. Snapchat has revamped ‘Snapchat Explore’, an educational resource for those curious about the ins and outs of the Snapchat advertising solutions. Get a comprehensive overview of the various Snapchat ad options. Learn more.